Flood your entire home with fast, strong and reliable WiFi. Built in Smart Firewall protects all your connected devices. Simply connects to the WAN port of your broadband modem. Compatible with all your WiFi devices. Powered by 6 high-gain omni-directional antennas with beamforming technology to expand wireless coverage area and eliminate dead zones. Built in RATtrap Smart Firewall which won the won Popular Science Magazine’s Grand Award for the Top Security Innovation. RATtrap Smart Firewall receives hourly threat intelligence updates to protect you from the latest threats. Can be setup in minutes to work with your existing broadband modem using any web browser or free downloadable apps for iOS and Android. Temporarily share your SimpliNET2 WiFi network with guests using the innovative GuestLink Sensing Pad on top of each unit. Each SimpliNET2 router or extender covers 1500-2000 sq. ft. You can extend coverage further by adding up to 10 optional Range Extenders (sold separately). Watch this video to learn more about SimpliNET2. With your home network under attack every few minutes, the built-in RATtrap Smart Firewall (winner of Popular Science Magazine’s Grand Award for Top Security Innovation of 2017) quietly functions 24/7 as an electronic sentry to keep all of your networked devices secure from malware, phishing, identity theft, and privacy compromise. The SimpliNET2 RATtrap Smart Firewall is backed by IoT Defense's Continuous 24/7 Monitoring and Protection Service with hourly threat intelligence updates for the first 12 months (monthly or annual subscription from IoT Defense required after 1 year). Each unit features dual-band WiFi and six high-gain, omni-directional internal antennas that widen the wireless signal coverage area and help eliminate dead zones. 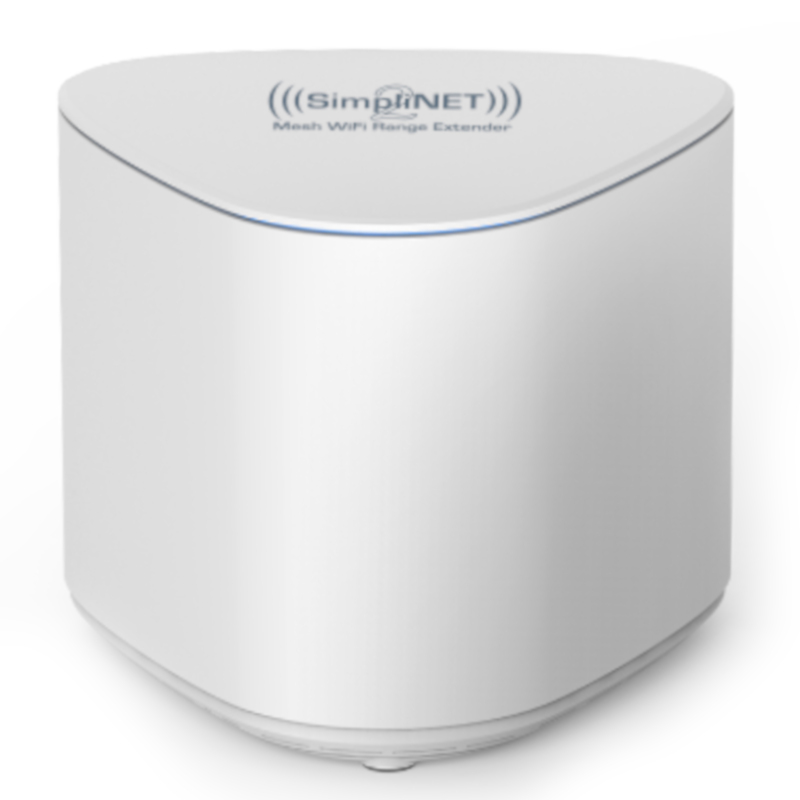 The SimpliNET2 AC2100 WiFi system produces a maximum speed of 1733 Mbps on the 5 Ghz band and up to 300 Mbps on the 2.4 Ghz band (better for connecting through walls). The built-in beamforming technology improves reception and reduces interference over longer distances by transmitting directly to a WiFi-enabled device, even as you and your device move around your house. Temporarily share your SimpliNET2 WiFi network with guests using the innovative GuestLink Sensing Pad. 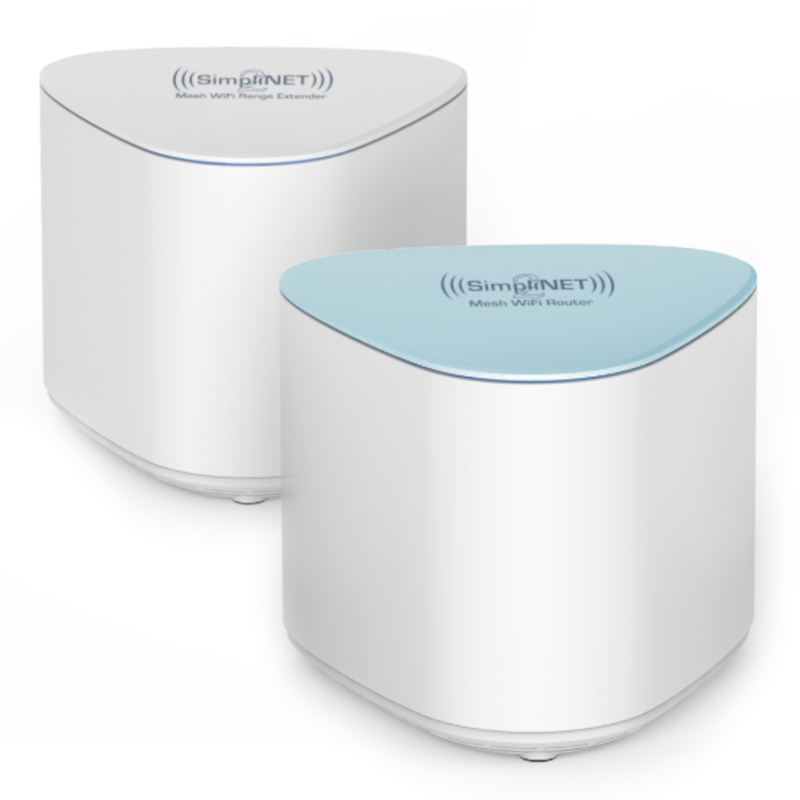 Simply touch the top of the router or extender and have your guests connect their WiFi devices to the SimpliNET2 Guest network without revealing your WiFi password. Great for larger and multi-story homes. When the SimpliNET2 Router and the two Extenders, included in this package, are placed strategically throughout your home, they provide fast, reliable coverage for 5000-6000 sq. ft.
Great for medium to large homes. 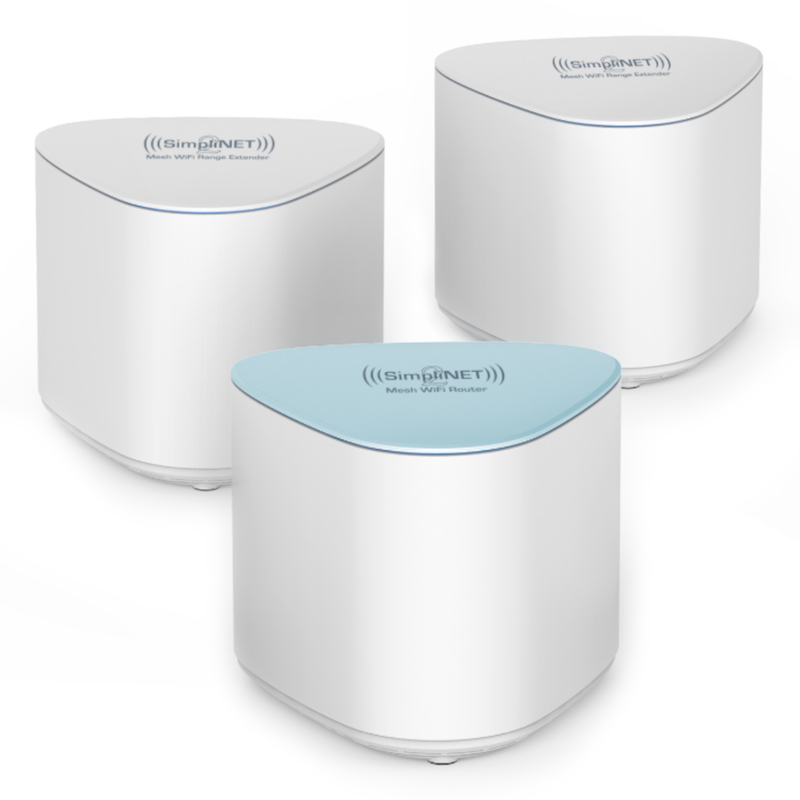 When the SimpliNET2 Router and Extender, included in this package, are placed strategically throughout your home, they provide fast, reliable coverage for 3000-4000 sq. ft.
Great for smaller homes, condos, and apartments. When the SimpliNET2 Router when placed centrally in your home, provides fast, reliable coverage for 1500-2000 sq. 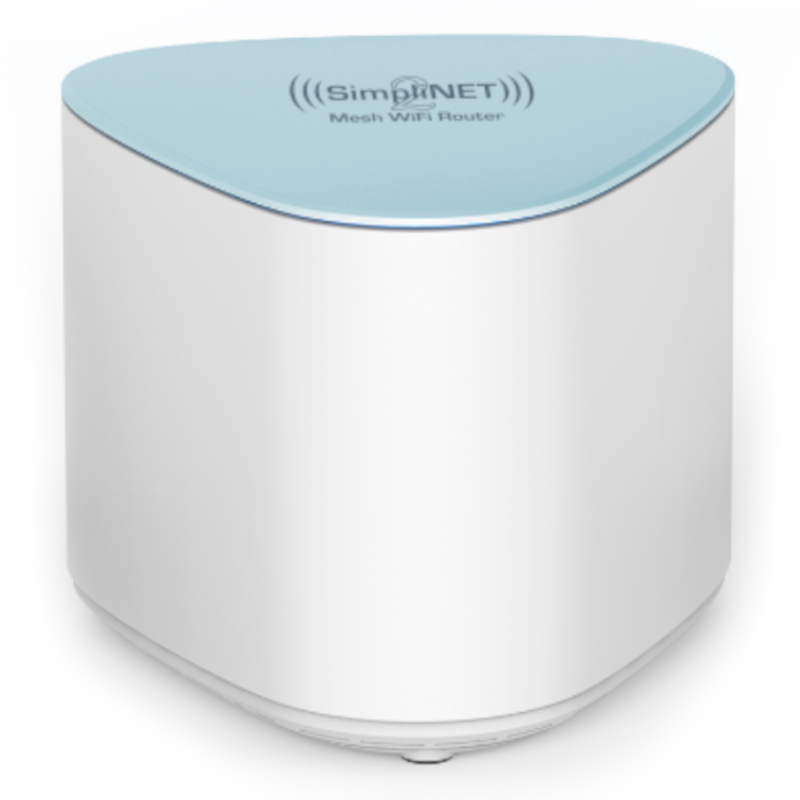 ft.
For use with the SimpliNET2 AC2100 Whole Home Mesh WiFi Router, the SimpliNET2 Range Extender provides up to 1500-2000 sq. ft of additional strong, super-fast, and reliable WiFi coverage. Free Continuous 24/7 Monitoring & Protection Service for first 12 months. Choose to continue after 12 months for only $9 per month.